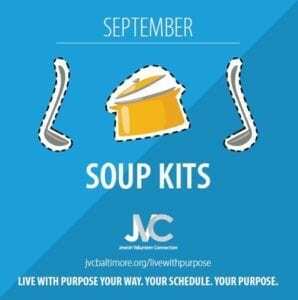 Join JVC this September and Live with Purpose to make Soup Kits! An easy, fun, and meaningful project you can do with your family this High Holiday season. Help keep families in Baltimore full and healthy. Who are we helping? 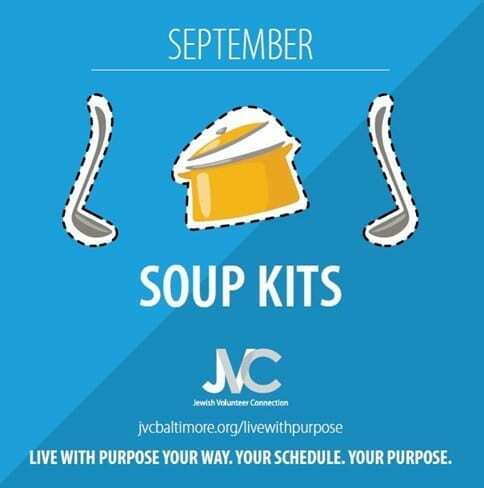 Soup Kits will be donated to various organizations throughout the city that help families and individuals in need in Baltimore City. Our main recipient is Living Classrooms. Using the above ingredients, scoop each amount into a jar or pouch. Decorate a blank label with well wishes (“Enjoy the soup!”). After sealing the bag, place a label with instructions on how to use the soup kit as well as the decorated label. Did you know? 1-in-4 children in Baltimore City’s schools are hungry when arriving to school, having not eaten a full meal since they left school the day before. JVC is selling the materials for 10 soup kits for $50. We also are offering just the special pouches – 10 pouches for $5. Interested in purchasing supplies for 10 soup kits?